This Inverted Yield Curve is confirming that as the political chaos emerges around the world, the more foreign capital is parking in the dollar. With the May elections on the horizon in Europe, and the October elections in Canada, April elections in Israel … etc. etc., the capital flows are still pointing ever stronger into the dollar right now. The foreign capital has been buying the 10-year notes driving the spread lower. Just look at the daily chart of the Euro and you will see it has taken a nose-dive from the March 20th high. We can see that the 10-year premium to the 2-year has been in a major decline ever since our War Cycle turned in 2014. 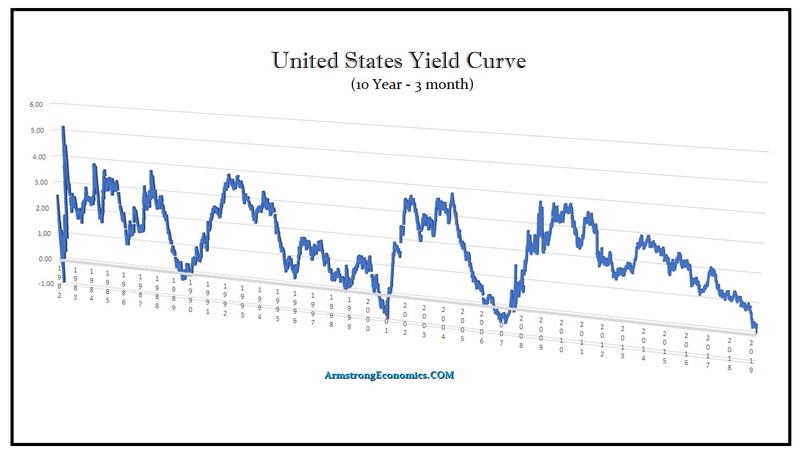 The Yield Curve (10-2yr) has not inverted. This is clearly showing the capital flight to the dollar that has been going on post-2014. This is not reflecting a major recession in the USA, but it is inferring that the ECM will be turning soon. 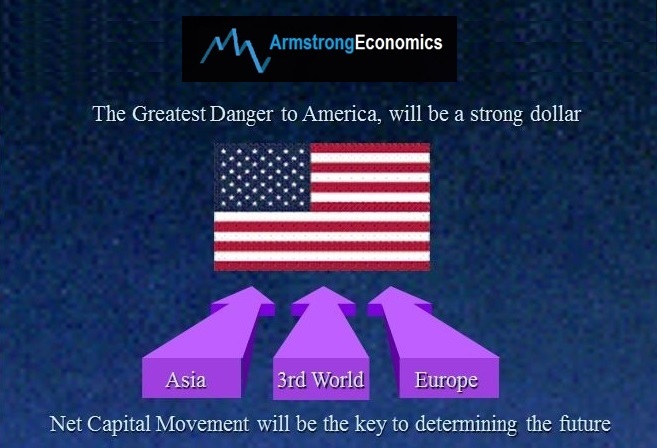 We are in serious trouble globally as people are turning away from the established political norm moving toward the opposite. I took this picture at a red light. 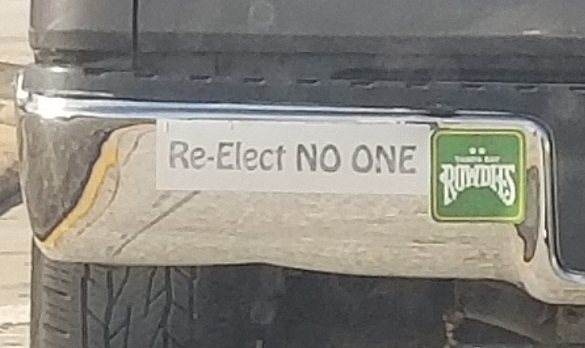 The bumper sticker read: “Re-Elect No One”. It was interesting to even see such a sticker. This is a reflection of the growing discontent with governments as a whole. As I have recently posted, 35% of Americans now believe that the government is the singles greatest problem. « Bonds & The Record High Short Position Can Majority Be Wrong?